Outlast is one of the most terrifying games we've come across in ages and while playing through it has been utterly traumatic, it's been rather refreshing at the same time. The reason for this is that a lot of mainstream horror games are toning down the scares and adopting more run-and-gun formats that empower players more – we're looking at you Dead Space and Resident Evil – but Outlast is resolutely old school. Here's a game that plonks players in a petrifying situation, pipes in a crushing sense of dread and then piles on the scares and shocks with aplomb. Outlast tells the story of a journalist name Miles Upshur who receives an anonymous tip about nefarious activities at the nearby Mount Massive Asylum. Upshur drives up to the asylum in the evening and, upon finding the front door barricaded he gains access by climbing up some scaffolding and through a window. This proves to be the worst idea he's ever had in his entire life. I will say no more about the plot. To be honest it's one of the game's weaker elements and its ultimate resolution is slightly disappointing. But that shouldn't hold true blue survival horror fans back from purchasing a copy of Outlast. If you accept that in horror sometimes the journey is the destination you'll be pretty satisfied with Outlast. It's a thrill ride that's by turns disturbing and terrifying throughout. One of the reasons for this is that the player is on the back foot for the entirety of the game. Upshur is, it turns out, a congenital pacifist, unwilling or unable to even throw a limp-wristed punch at any adversaries he encounters. If he runs into any of the residents of Mount Massive Asylum, his (and by extension, the player's) only option is to run and hide. The only other outcome is death. The only item that Upshur has to help him is a camcorder with a rather rubbish battery-life. More often than not, the player will find themselves in a room with absolutely no light in it at all. In this instance they can use the night-vision setting on Upshur's camera to see in the dark. Doing so bathes everything in their field of vision in a stark, blurry green hue, making their surroundings and any potential attackers look all the more terrifying. It's a neat trick, even though it feels borrowed wholesale from the Spanish horror film [REC]. 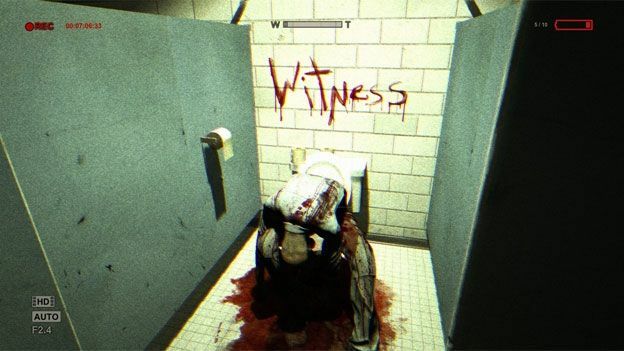 Mind you, this isn't the only reference point for Outlast. The game's asylum environment and one of its otherworldy plot elements owes a debt of inspiration to the indie horror flick Session 9. One of the things that makes Outlast such a test of endurance is the fact that the game's location feels so authentic – from the creaking floorboards, to the rattling gates to the horrors shuffling just out of sight in the darkness. Sure, there's rather a large amount of batteries lying about, but this fact doesn't exactly take the air out of the game's choking atmosphere. Mount Massive Asylum isn't some Gothic Punk cathedral like the titular madhouse in Batman: Arkham Asylum. Rather, it feels like a real place, which makes the horrors it contains seem all the more plausible. The developers are also rather tactile in their approach to frightening the player. The set-piece scares, when they come, are hardly subtle, usually accompanied by screaming violins and horrifying visuals. But the game's creators also know that they're able to unsettle the player by simply allowing them to fret about what may be just around the corner. They know imagined horror is almost as frightening as a monster storming towards the player. To that end they leave some stretches for the player to simply wander the asylum, listening to Upshur's frantic, panicked breaths. It's a pity the developers don't do more of this, and instead starts flinging 'boo' moments at the player at something of a clip. It's affective in the game's earliest stages – we actually cried out in terror a couple of times during the game's first 15 minutes – but after a time, players are likely to become numb to this constant barrage of jack-in-the-box scares hurled at them. In a way, the method that the developers continually employ to make the player jump becomes as irritating as it is immediately shocking. But it has to be said that Outlast accomplishes what it sets out to do, which is to scare the bejesus out of players as often and as efficiently as possible. It's a pity the narrative unravels towards the end, but that one concern aside, Outlast is an effective and consistently terrifying survival horror game that's likely to satisfy the demands of those fans of this genre who constantly see their extreme entertainment watered down in order to attract more audience numbers. If you really want to test your horror mettle, we recommend playing this game in the dark with your headphones on. Go on: we dare you!